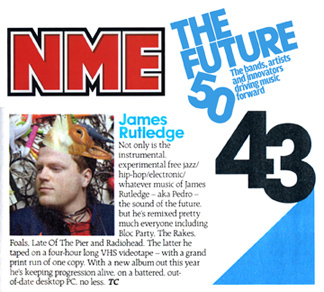 Not only is the instrumental experimental free jazz/hip-hop/electronic/whatever music of James Rutledge - aka Pedro - the sound of the future, but he's remixed pretty much everyone including Bloc Party, The Rakes, Foals, Late Of The Pier, and Radiohead. The latter he taped on a four-hour long VHS videotape - with a grand print run of one copy. With a new album out this year he's keeping progression alive, out a battered out-of-date desktop PC, no less.